A new app by a local developer may make the City's restaurant-inspection data a little too accessible. Screenshots of Matthew Ruten’s Dinesafe app. There are things about your favourite restaurants that you’re probably better off not knowing. These are things that cling to the unwashed hands of line cooks—things that hide in the pantry and nibble on the muffins. Nobody really wants to find out that the tanginess in their go-to takeout dish is actually the product of five separate health-code violations. But these days, Toronto Public Health archives years of restaurant inspection results online, making it easy—irresistible, even—to check up on any eatery in the city, including the two previously mentioned. It’s problematic knowledge (do we stop eating somewhere because an employee didn’t wash some tongs last year? ), but it’s not hard to come by. 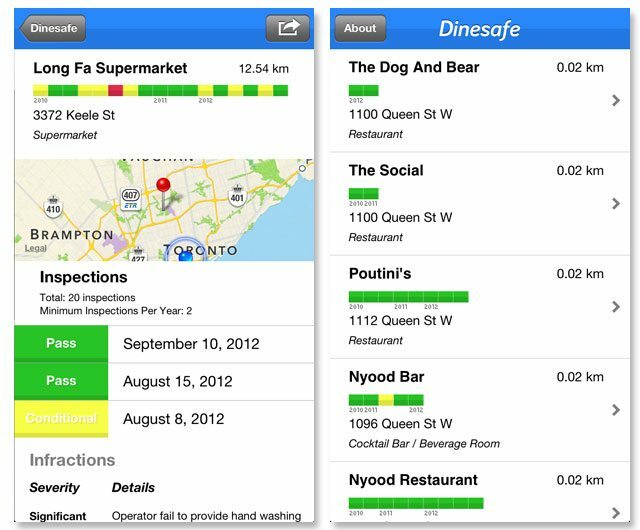 Now, a local developer named Matthew Ruten has found a way of making DineSafe information even more accessible: using the City’s open data, he’s created an iPhone app that lets users view the health-inspection histories of whatever restaurants happen to be near them. The app, which is called “Dinesafe,” has been available in Apple’s app store for 99 cents since last week. It uses the iPhone’s GPS capabilities to spit out DineSafe information on whatever restaurants happen to be closest. The app displays restaurant names and addresses next to handy colour-coded graphics that let a user know, at a glance, how often each place has run afoul of inspectors. (Just as on the official DineSafe website, green is good, yellow not so good, and red the worst.) Flicking through the different restaurant profiles is more or less what reading Yelp would be like, if all Yelp reviews were written by bureaucrats. It’s a simple app, but it’s extremely usable. If you’re sure you want this information with you at all times, it’s worth the money. Aside from its obvious utility as a way of avoiding food poisoning, the app could even be fun as a conversation starter at a pub—as long the pub has a clean bill of health. Even so, think carefully before you expose yourself to all this data. You can’t forget this stuff once you know it, just like you can’t go back in time and un-eat a meal.